Overview: The Belkan War officially comes to a close. An armistice treaty between Belka and Osea is signed in the former Belkan city of Lumen, in what is now functionally Osean territory. As the signing ceremony gets underway, the Galm Team is dispatched to Anfang on the northern coast of Belka for one final, covert operation to eliminate a large force of Belkan troops who remain defiant of the cease fire order. Guest Commentators: Im joined for this final three-part mission by three more awesome folks. which has also been lost to the Bliphole. Well not completely lost. Mostly 90% lost depending on which country you live in. 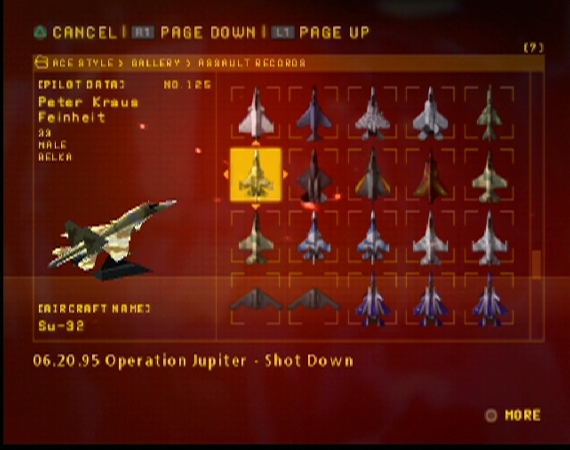 And for Mission 14C, Jupiter Strike Team, I am joined by our returning champion Kadorhal. Since his last appearance in the LP he has started up a run through of Postal 2: Paradise Lost. We return to the realm of the orchestral for the title of this weeks episode, The Final Overture. It seems a somewhat paradoxical thing to call it the final overture, as an overture itself is meant to be played at the beginning of an opera or symphony, usually right after the diapason. How curious. This is also the point in the game where the soundtrack begins to rhyme with itself too. There are remarkably few recurring leitmotifs in Zero compared to other games in the franchise, opting instead for recurring instrumental sounds; the mandolin, violin, drums, castanets, and guitar, primarily. 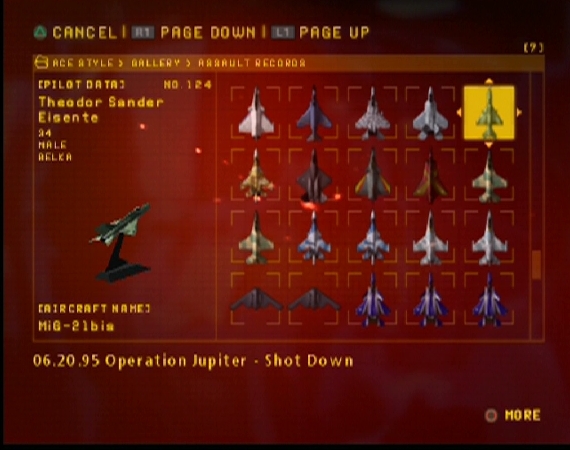 Here, however, the track that plays over this mission, The Final Overture is a remix of the track that played over Mission 2, Annex. Both tracks share a similar middle section, only The Final Overtures has a fuller sound to it than Annexs, showing how far weve come from the start of the war now to the end of it. 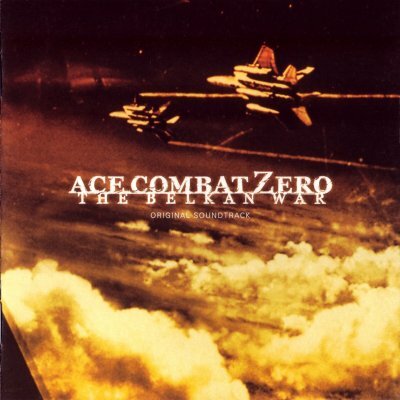 Its one of my favorite tracks from Zeros soundtrack, and definitely worth a listen. 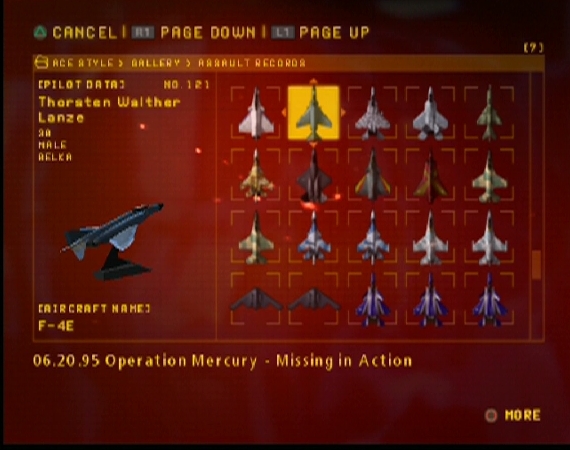 Again, its highly appropriate that this mission is codenamed Broom, because its all about sweeping up the last remnants of the Belkan military before peace breaks out and everyones out of a job. 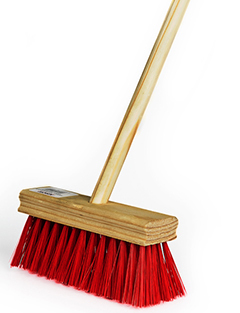 Also, take note that while the subtitles and title card for the mission all say Broom, Intel clearly says Operation Bloom, (which actually still fits with the whole this is really about beginnings rather than endings theme of the mission). 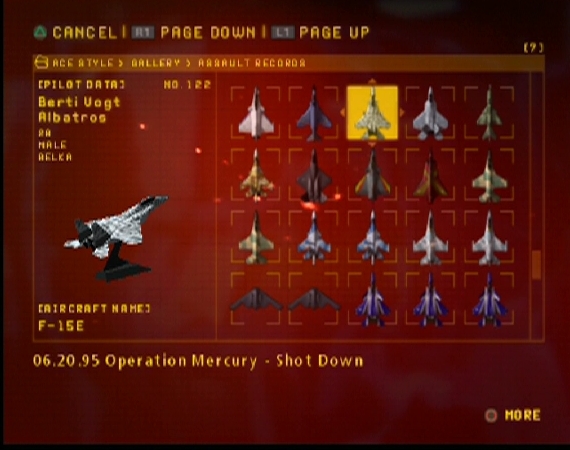 This will not be the last time an Ace Combat games localization efforts get tripped up by the dreaded L/R ambiguity when translating from Romaji to English either. Its one of the more minor details of this mission, but we get a brief glimpse at Strangereals cosmology and mythology thanks to the strike team code names here. For starters, we know that the Greco-Roman pantheon, or at least a close analog with the serial numbers filed off exists in Strangereal and that most likely the planets of its solar system also have the same names as our own. Not too surprising of a reveal over all. After all, Strangereal is still referred to as Earth in-universe, and in later games we do get brief, clear looks at its night sky and familiar constellations such as Orion are clearly visible. 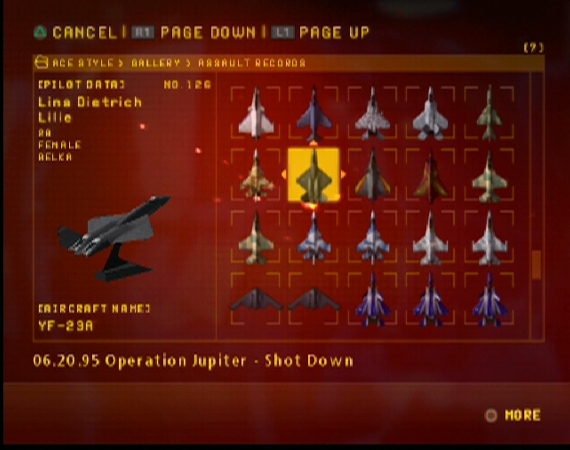 There are also several oblique references to Christianity, Islam, and Judaism in Strangereal, so those religions also exist in the Ace Combat shared universe. 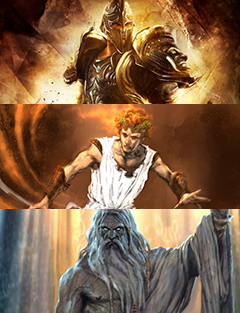 youve never actually read Greek mythology. 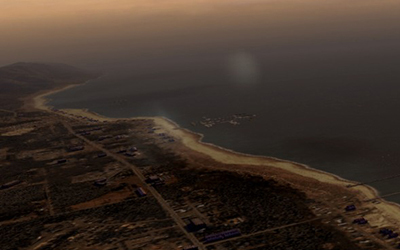 The name of the town this mission takes place over is Anfang, on the northern coast of Belka. This is the closest we will ever actually get to the Belkan capital of Dinsmark now that the war is over. The small coastal town was a fairly popular tourist destination prior to the start of the Belkan War, and was considered a local cultural centre rich in medieval Belkan history. It was also a farming breadbasket town for Northern Belka, producing many types of grains, wheats, olives, and wines at on its local farms. Much like Hoffnung, Anfang is another little on-the-nose ripped straight from German word. In this case, anfang mean start or begin. Again, this seems very paradoxical, as weve reached ostensibly the end of the Belkan War, and yet were being presented with all these signs that something is beginning. A city once on the southern border of Belka, now residing fully within Osean territory as of the signing of the Belkan armistice on June 20th, 1995. The capitulation ceremony where Belka officially surrendered to Osea was held in Lumen and attended by representatives from the primary national players of the Belkan War, Osea, Belka, Ustio, Sapin, Recta, Ratio, Gebet, FATO, Welvakia, Nordlands, and Yuktobania. The primary signatories of the so-called Treaty of Lumen were the Osean President, and Belkan Chancellor Waldemarr Rald. And because this update is all about dat irony, lumen is Latin for light, even though this mission is all about the war beginning to enter a period of shadows and secrets. if you were feeling melodramatic about it. I suppose this is also as good a place as any to take stock of the Belkan War as a whole. The entire war was one MASSIVE geopolitical miscalculation on Belkas part. It won them no allies, restored none of their lost pride and strength, earned them enemies and ire the world over, further ruined their economy, and actually cost them territory in the long run. If you check the map and compare pre and post-war Belka, youll see Belka lost roughly half the territory it had left to Osea. It also nuked itself for no viable reason, leaving a scar on itself that will take decades, if not centuries to properly heal. In all, Belka has left itself worse off than if it had never launched the war in the first place, and has crippled itself into an international afterthought, never to play a leading role in global politics ever again... publically. That being said, Osea is not entirely blameless in this affair. The Treaty of Lumen was widely critized as being heavily one-sided in favor of Osea, almost to the point of spite towards Belka. In addition to harsh economic sanctions, the forceful disarmament of its military, the requirement that Chancellor Rald resign his leadership position within one year, and the relinquishment of all South Belka Munitions Factory and Project Pendragon assets to the Osean Central Intelligence Agency, the treaty also called for the ceding of all Belkan territory south of the Waldreich mountainswhich had already surrendered to the Allied Forcesto the Osean Federation. 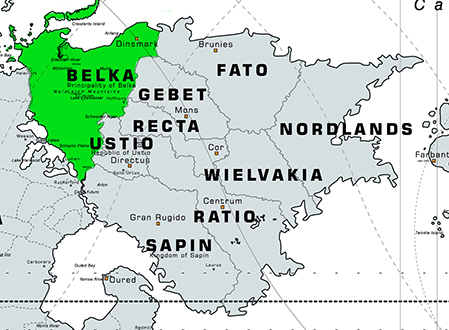 The treaty meant to keep Belka from ever making war upon is neighbors again was seen by many both inside Belka and out as Osea placing its boot on an already broken nation. This can easily be read as Osea once again taking advantage of any geopolitical loophole it can to further its own causes and consolidate more power and wealth for itself while coming across as a champion of peace and justice to the rest of the world. Osea just gained itself a 68th state, and hundreds of miles of territory dotted with farms, factories, military bases, oil wells, and mines, all of which once powered Belkas attempted rebirth, and would now work to fuel Osea. Osea also now has a strategic foothold in the Belkan sub-continent, now sharing direct land boarders with its allies Ustio and Sapin. 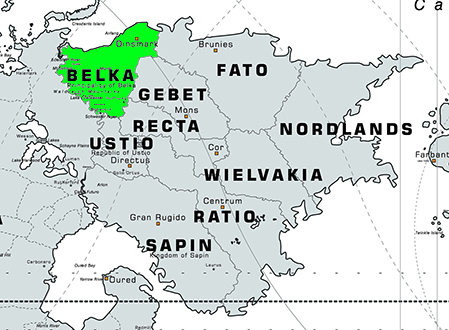 Given how readily they snapped up the territory once it became available to them, its hard not to imagine that the legal annexation of most if not all of Belka (after 50 years of open belligerence towards Osea on Belkas part) was the real reason for Oseas entry into the Belkan War all along. If there were any bright spots to be seen in the Treaty of Lumen, it that it laid the groundwork for the eventual resolution at the Assembly of Nations which resulted in the near total nuclear disarmament of the worlds reigning nuclear powers. The world would hopefully never again have to bear witness to the horrors of an event like the Seven Pillars, and if other nations ever went to war again, the hope remained that it would not devolve into another nuclear catastrophe. The other bright spot to come of the Belkan Wars end was that it also marked the end of the Cold War between Osea and Yuktobania. Fifty years of tension and nuclear standoff between Osea and the UYR quickly evaporated after the signing of the Treaty of Lumen. Yuktobania lifted its once impenetrable iron curtain to the nations of Osea, Usea, and Anea, as its ruling Politburo began enacting cultural and democratic reforms. 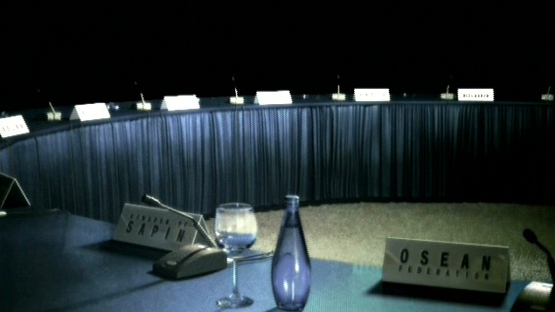 The thawing of relations between the two superpowers culminated in the signing of the Osea-Yuktobania Peace Treaty in 1996. However, the emergence of this new geopolitical alliance and the collapse of Belka would ultimately set the stage for another conflict on Usea in 1998. In response to what was seen as a potential threat from the emerging Osea-Yuktobania pact, the nations of the Usean continent would attempt to form their own continental superpower, the USEA Federation, or the United States of Euro-Asia. However, regional tensions and clandestine interference from Osea would see the would-be pact dissolve into in-fighting and eventually an all-out continental war among the nations of Usea later that year. Because Osea Is Not The Good Guys. But were getting ahead of ourselves now. Active on the western frontlines near the end of the Belkan War. Already superior in ground combat, he is credited with shooting down seven aircraft during Milo Operation. He died in action, the day after Belka surrendered, far out in the Sea of Anfang. 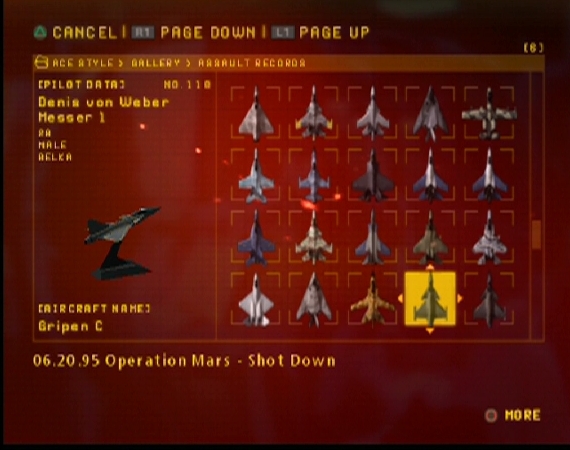 During the war, records show an Ustio mercenary officer with the same first and last name, however, it is unclear if this was Weber himself. Further investigation is necessary to establish his background. Graduate of the Kellerman Institution, a Belkan Air Force Academy that has produced countless elite pilots. Even after Belka surrendered, he did not comply with the disarmament procedure and instead formed a rebel alliance. 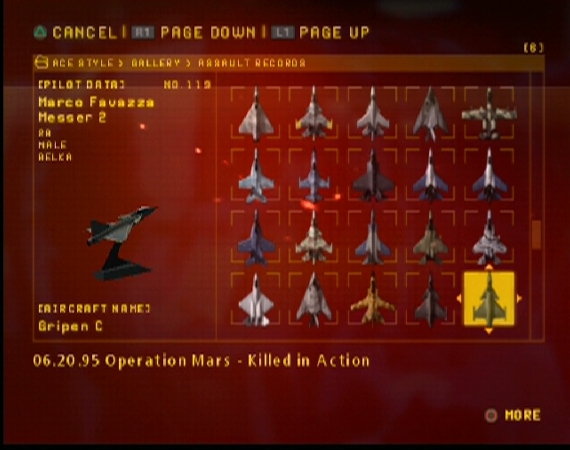 He died when his plane was shot down by mercenaries. Became an instructor in the Belkan Air Force after the war. Possessing an unusually strong heart and lungs, he holds a record of being able to withstand 10G, which surpasses the human limit of 9G, in a G-Force training craft. This incredible amount of G-Force during a turn is called the "Kranich Turn". 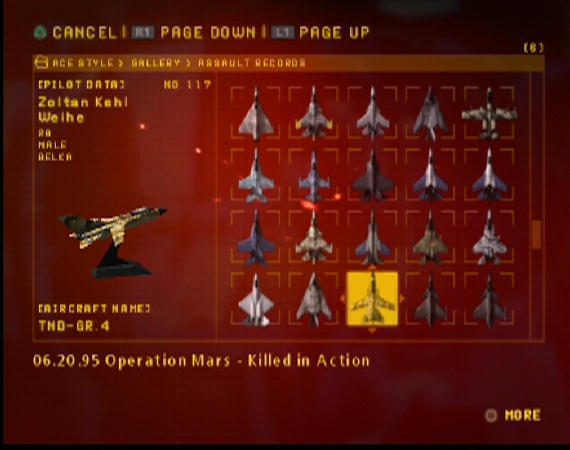 Detailed information regarding this pilot is unavailable. 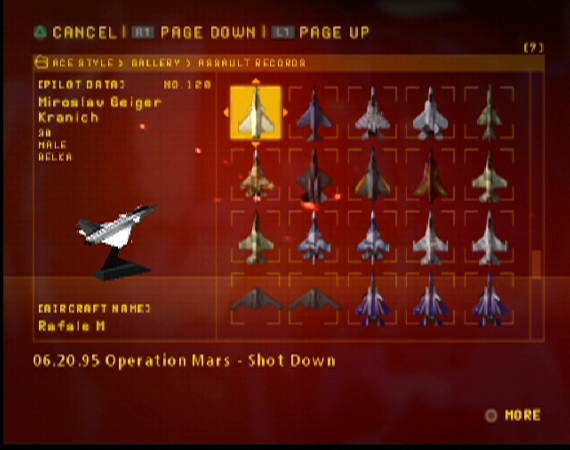 After being shot down by the Galm Team, he was captured as a prisoner of war, but was able to escape. Falsifying his nationality, he crossed over the borders of Ustio, Sapin, and Osea, ultimately returning to his native Belka. Currently, he is an adventure seeker who travels around the world. 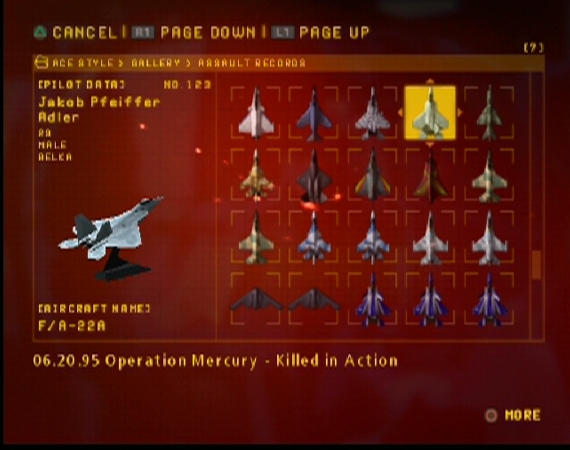 While in the Air Defense Force for A World With No Boundaries, he brought down a legendary number of planes, earning himself the nickname "Raptor". He died at the end of the war amidst turmoil, when his entire squadron was brought down by the enemy. Falling seriously ill at Anfang, he was discharged from the Army and is now employed at North Osea Gründer Industries. As a member of the UAV Development Team (Unmanned Aerial Vehicle), he is responsible for developing the AI Technology. Along with Winston Pettigrew, he is reputed to be an expert bomber. When he was shot down at Anfang, an Allied Forces cruiser took him under protective custody. 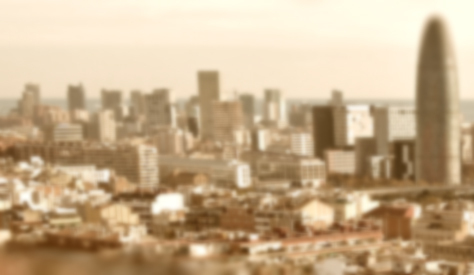 Having acquired permanent residence status in Osea, he currently lives a rather ordinary and peaceful life. A decorated female pilot whose expertise was to assault the enemy by descending very quickly form a high altitude. While in the Academy, she single-handed brought down her instructor. After the war, she was recruited to be an instructor at Osea's Wessen Military Academy. Belka prior to the signing of the Treaty of Lumen, and Belka after.